Can you believe that today is reveal day?! 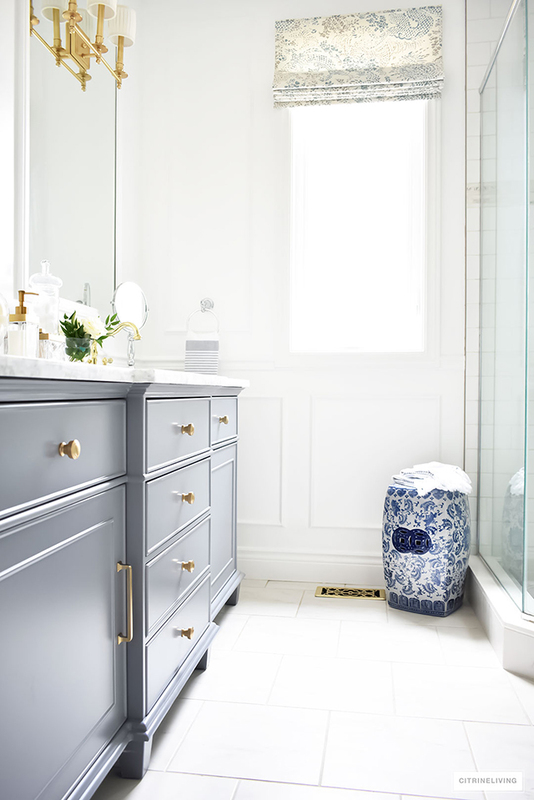 The past seven weeks have gone by in a blink of an eye and I couldn’t be more excited to share our master bathroom makeover reveal with you today! 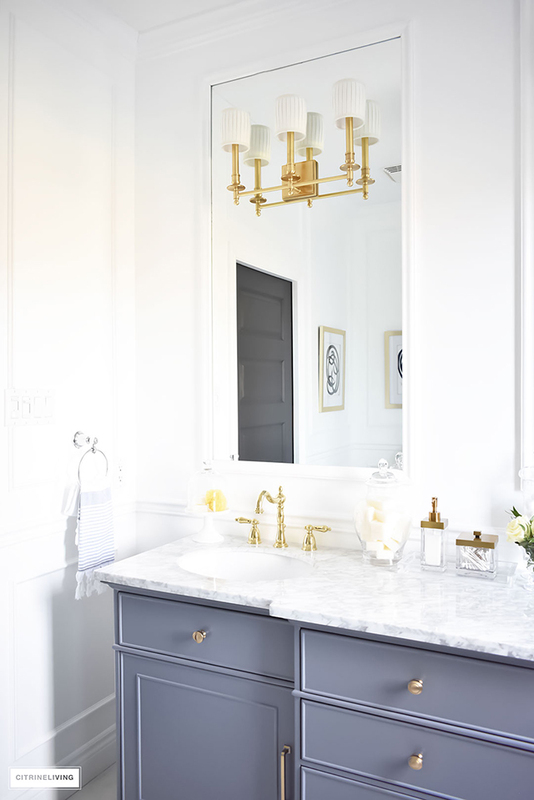 When I first contemplated joining this huge design blogging event, all I had in my head was a vision of a clean, bright master bathroom with an upscale hotel feel. Something with an old-world elegance that meets a modern vibe. A place where we could feel transported every time we crossed the threshold, where we could feel energized in the morning and relaxed at night. 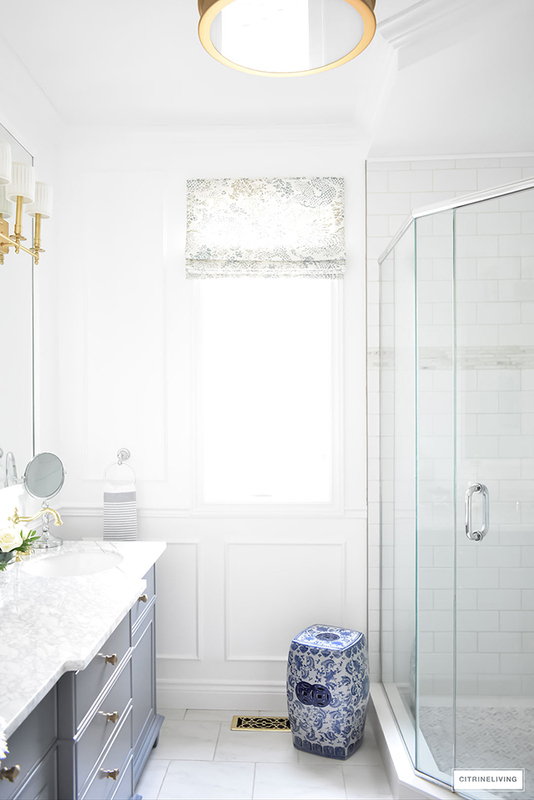 I knew I wanted my color palette to be grey, white and brass with a small dose of blue and white thrown in. To see that vision come to life has been so exciting, and I know you’re going to love this as much as we do! Before I share the reveal with you, above is a little reminder of what our bathroom looked like before. It was pretty, but dated and it just didn’t have the energy in the space that we were craving. I’d like to extend a HUGE thank Linda, of Calling it Home for graciously hosting this incredible design event in partnership with House Beautiful magazine. What a fabulous opportunity for us to be able to breathe new life into this dated space. 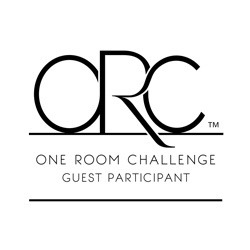 When I first heard of the One Room Challenge a few years ago, I had no idea what it was. As I dove into the blogging world and met more and more people who were participating, I knew this was a challenge I wanted to face head on! It’s quite the task to take on in such a short period of time, and if it weren’t for my amazingly talented husband, Neil, none of this would have happened. He is the 24/7/365 handyman and my partner in crime, and everything we’ve done in our home has been together. This was no easy task and we did it! If you’re joining my for the first time, welcome to CitrineLiving! I hope you enjoy your stay! This season’s ORC was extended by one week and you can have a look back at the last six weeks of the challenge that brought us to where we are today : WEEK ONE | WEEK TWO | WEEK THREE | WEEK FOUR | WEEK FIVE | WEEK SIX. Also before I begin, I want to extend a HUGE thank you to our amazing sponsors once again, for making this room become our reality : The Mine | Tonic Living | Kristen Tirney. Ok, let’s get right to it! Come on in! The after could not be more perfect…bright, airy and crisp is the feeling in our space, and that hotel vibe I mentioned, definitely fits the bill for us. All sources are linked down at the bottom of my post! Affiliate links are also provided in this post for your shopping convenience – while I make a small commission on these items, it’s no extra cost to you! 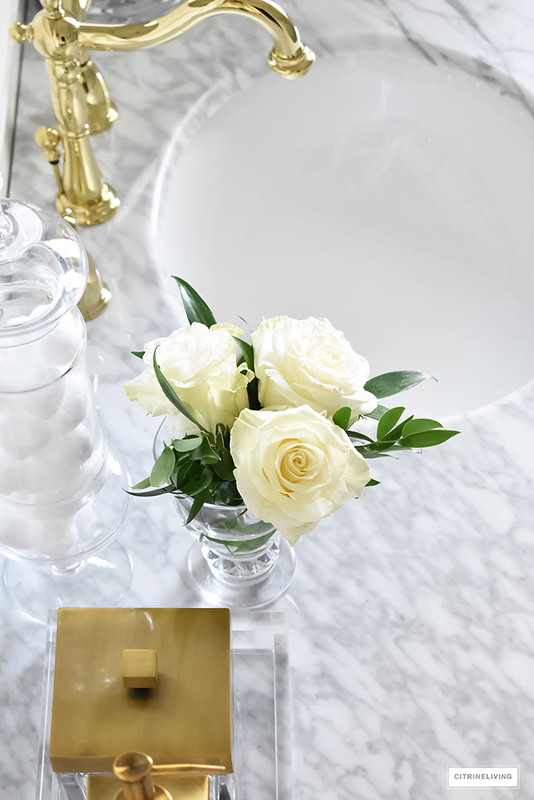 First thing’s first – our new vanity was the biggest game changer in here. Working with The Mine (our main sponsor) was the most amazing experience – I could not have brought this vision to life without their support! Their team was so helpful in every way, always responding to my needs and so open to my vision – I am truly grateful for such a wonderful partnership! 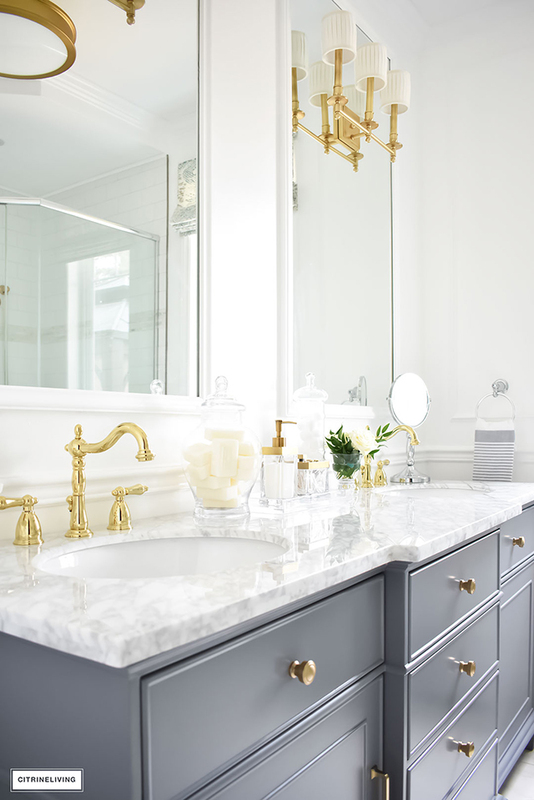 Getting back to the vanity… the rich color, the handsome lines, the carrara marble top and all of that beautiful detailing makes me just a little bit giddy. 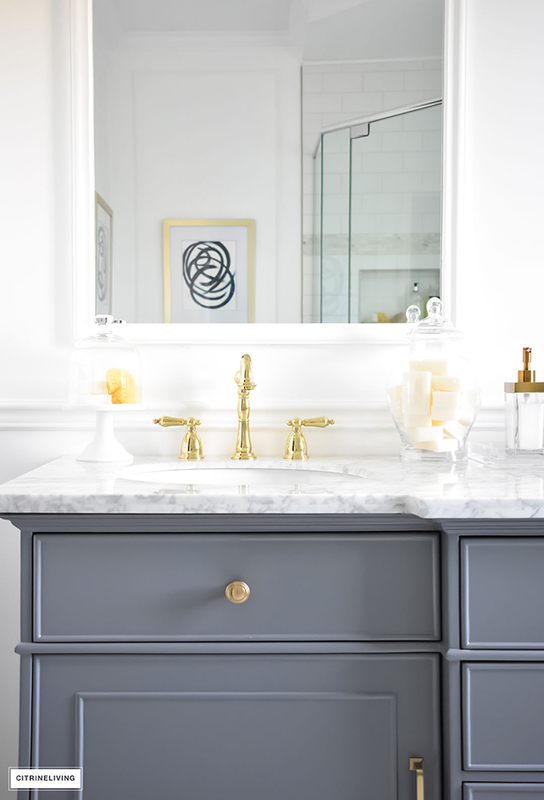 It has tons of storage, much more than our vintage dresser-turned-vanity, and my favorite part was putting my own signature on it, by changing out the brushed silver hardware it came with, for these gorgeous Menlo Park pulls and knobs by Shaub & Company. 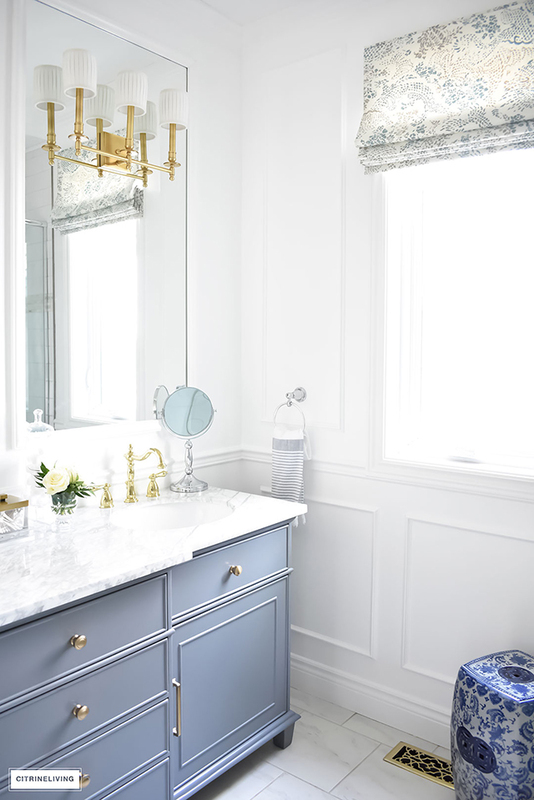 I love the blue undertone of the grey and how commanding this vanity is in our space. 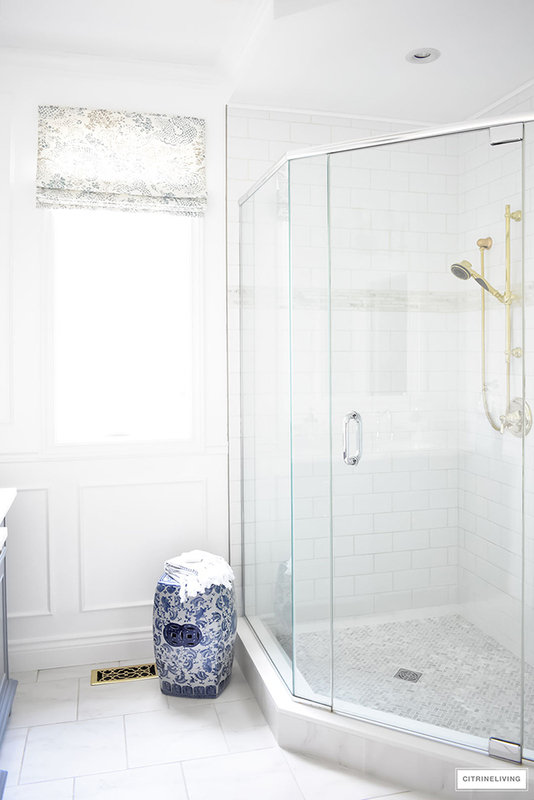 It’s stately and elegant and is the perfect foundation for our bathroom. One of the key elements to the design of the room, is the wall panelling that we added above the chair rail. It makes the ceiling feel twice as high as before, and painting out the entire space a bright white (this us Ultra Pure White by Behr) opened up the space even more. The panelling on the bottom half was beautiful before, but bringing it up all the way to ceiling was one of the smartest decisions we made in here. The mirrors are another huge design feature in the space. They’re 55″ tall and sit at the same height as the wall moldings. They too, bring your eye right up to the ceiling and the mounted wall sconces are so elegant. 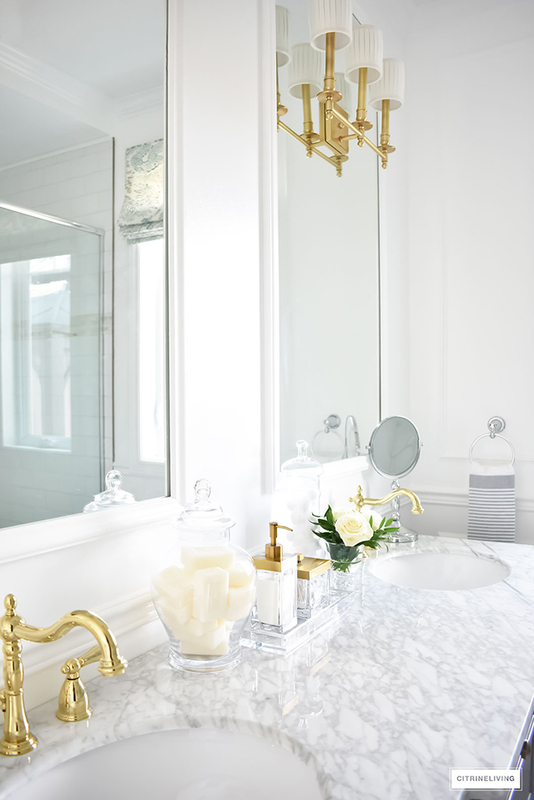 I have always dreamed of sconces mounted on mirrors! So chic! Our new lighting is perfect in this room. 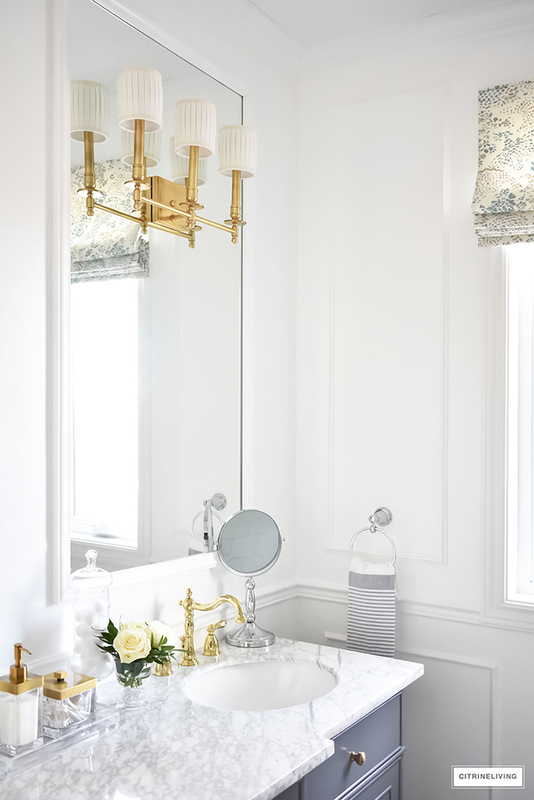 The brass wall sconces by Hudson Valley Lighting and the semi-flush ceiling light by Minka Lavery, are both so handsome and tailored. 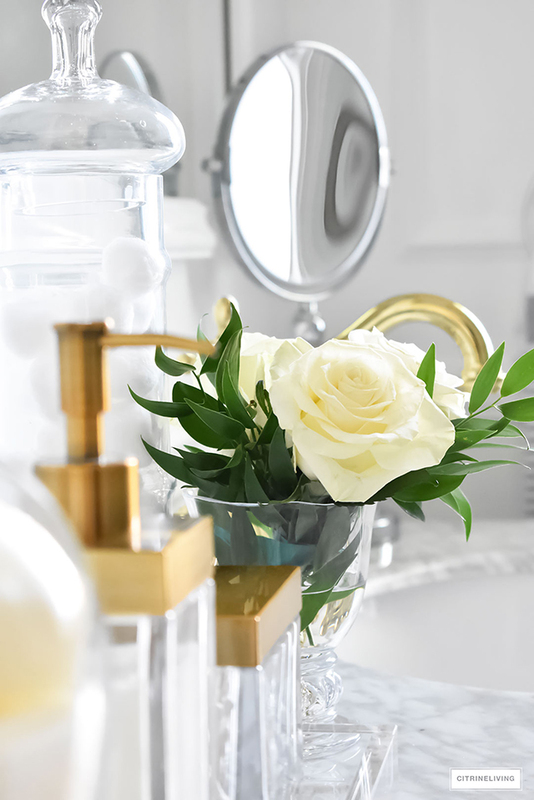 They provide such a great balance to the feminine quality of the plumbing fixtures and the brushed brass is rich and timeless. I am in heaven when I’m in here, you guys! Between the wall panelling, vanity, the wall sconces and the plumbing fixtures I really can’t pick a favorite element. I can tell you, I love how it all marries together. They all have traditional lines but feel so clean and modern with this color palette. Polished and brushed finishes mingle with a mix of brass and chrome, and to me, that’s a modern interpretation of these traditional pieces. I absolutely love to mix metals and I’m never afraid of it! With the right balance, you can pull this off easily. 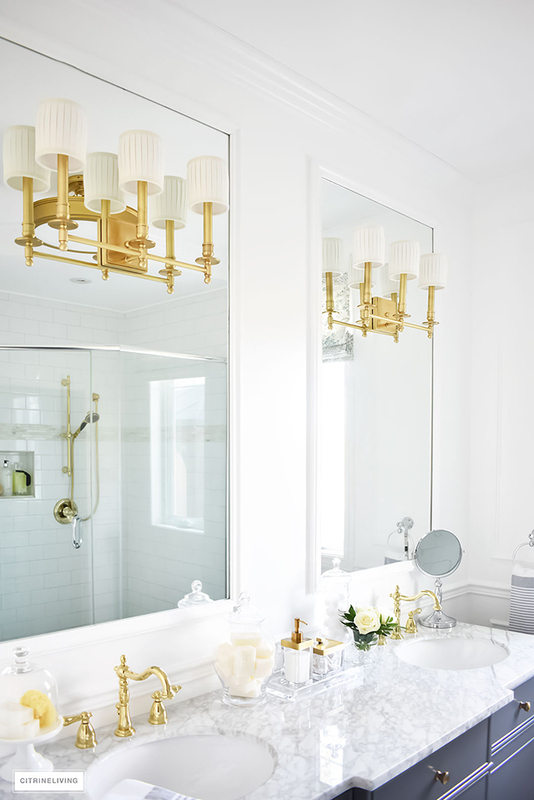 You’ll notice that the lighting and the vanity hardware are both brushed brass, while the faucets and shower system are polished. 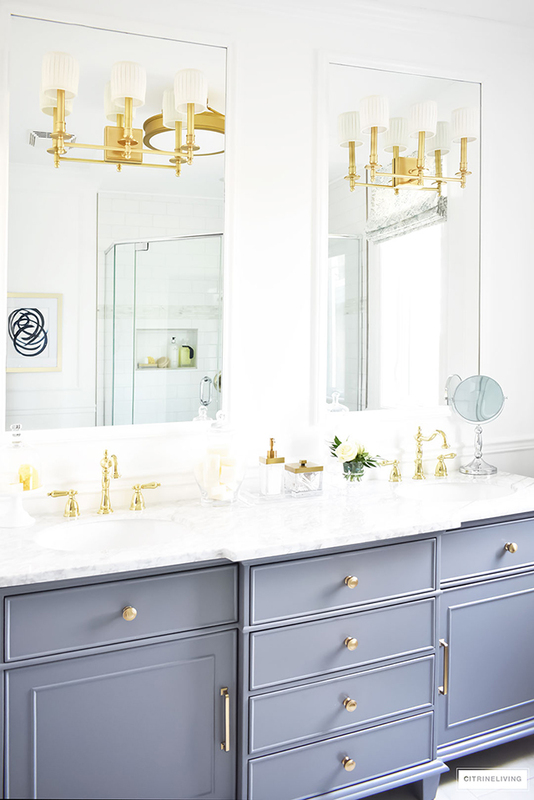 I wanted all of the plumbing fixtures to be polished so there was a sense of cohesion in the space, even if there are many different finishes going on. If you’re mixing metals, colors or finishes, it’s key to find a way to bring in consistency. 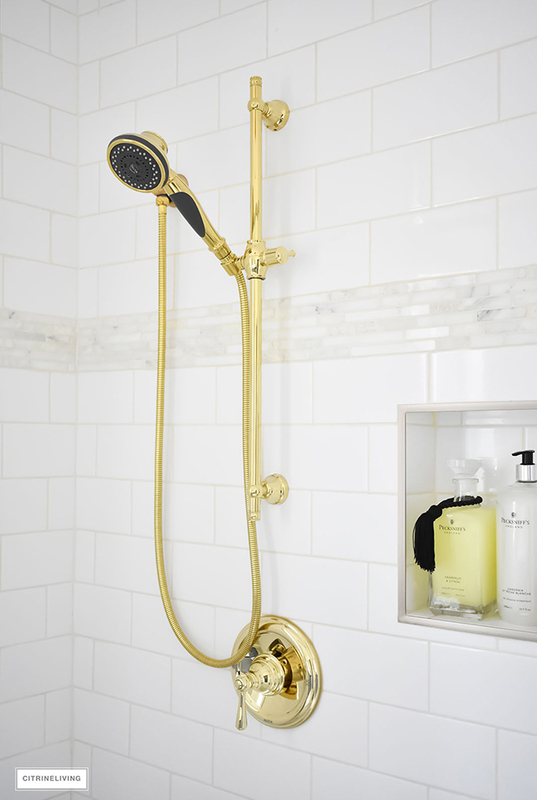 Our new brass handheld shower system by Delta, is the perfect compliment to our shower. Again, it has old-world elegant features that make me very happy :) I did end up ‘customizing it’ somewhat however. I wanted the handle to have a slightly more traditional quality to it. So I sourced this handle from Moen – it turned out to be a perfect match. This set is so much more beautiful than our previous chrome one and I don’t think I’ll ever get enough of the brass in here. Let’s talk about the original artwork from Kristen Tirney. It truly could not be a better fit. You’ll laugh at this, but I love to stare at it while I’m showering! I actually stare at the whole space and love to take it all in! Something about these two pieces speak to me and I love the modern edge they bring to this otherwise traditionally designed room. It’s clean, elegant and makes a strong statement without being overpowering. 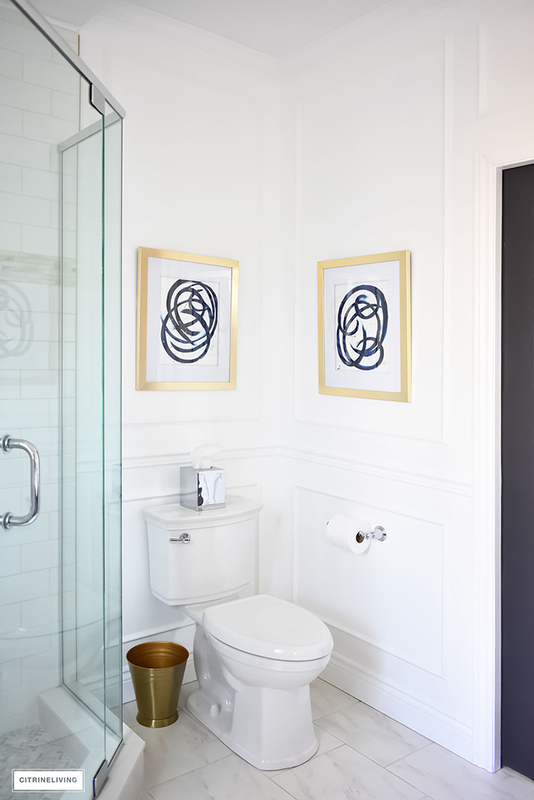 The navy brushstroke swirls are dotted with flecks of gold paint, I love the way this artwork is layered. When Kristen approached me and asked if I’d be interested in sharing her artwork in here, I was instantly smitten with her work. She’s such a talent and so kind. She even created the brushstrokes to my specifications – talk about having a commissioned piece of art! 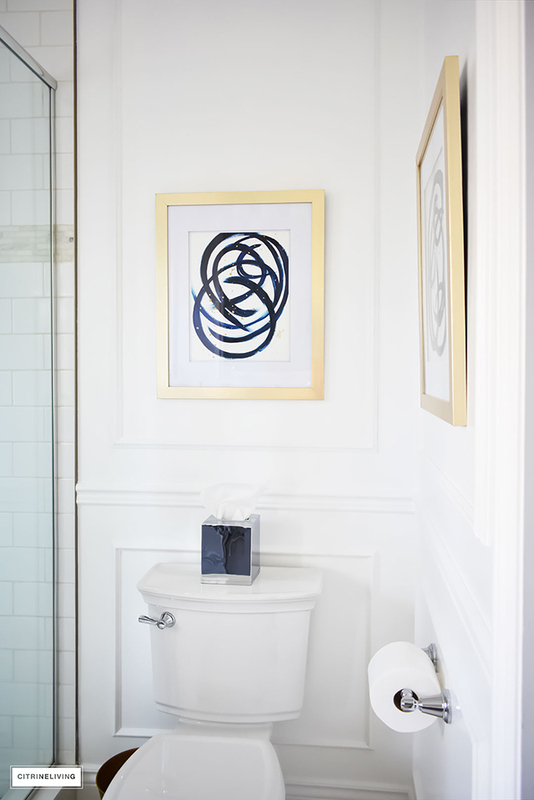 Our bathroom is too small to have the toilet occupy a separate space, but between the gorgeous lines of our new toilet – yes, I said the toilet is gorgeous haha – and Kristen’s stunning works of art, this corner goes from basic utilitarian to upscale elegant and chic. 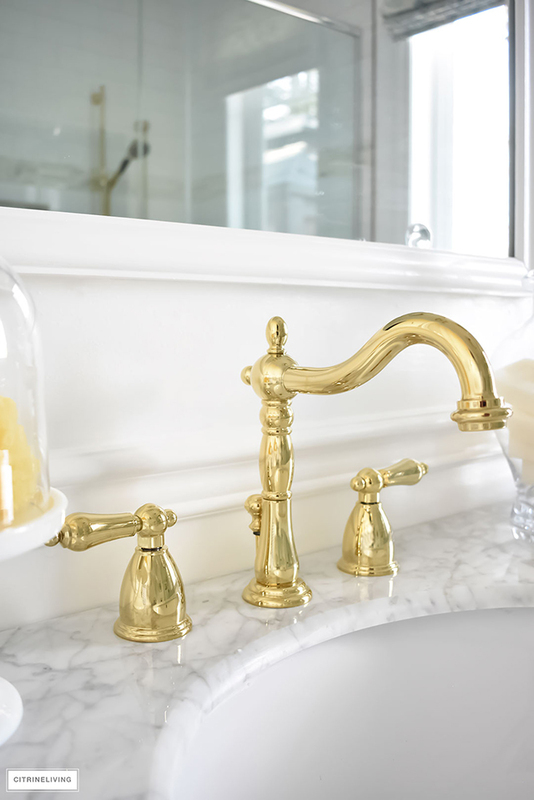 Our new brass faucets are like jewelry for the marble counters and I can’t get over how gorgeous they are! 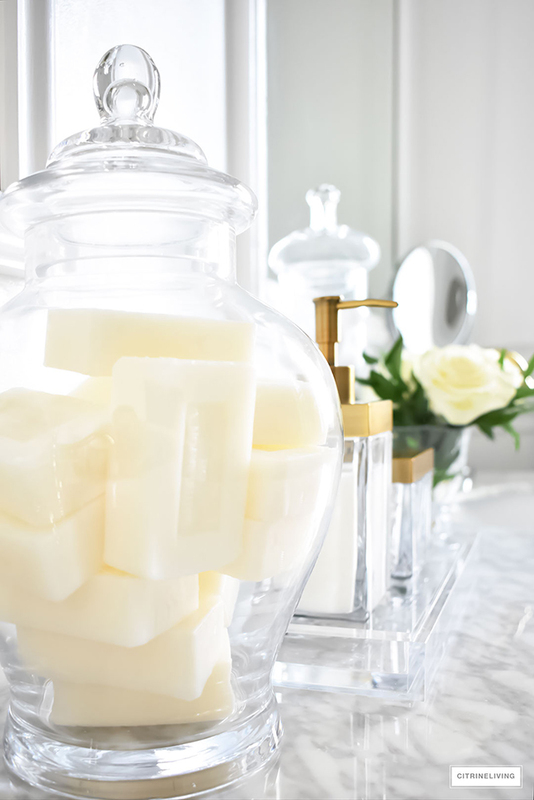 They bring in an element of femininity and I truly love that balance of masculine and feminine within this bathroom. 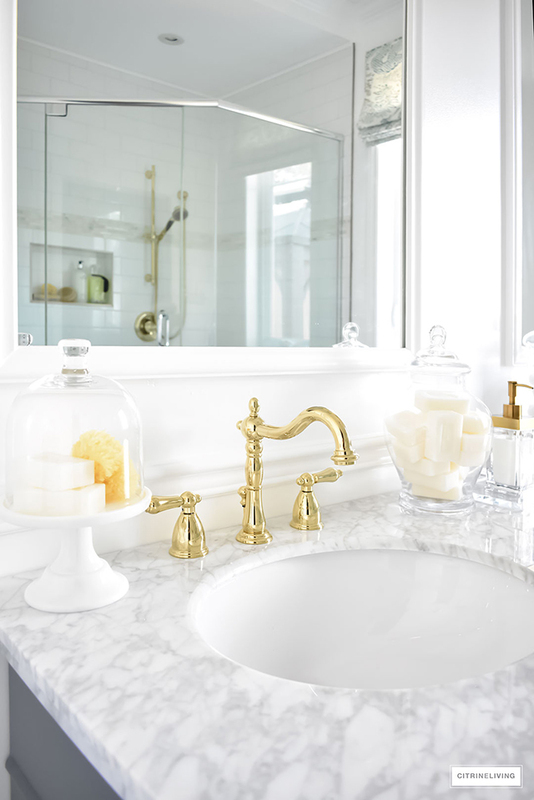 For the accessories, I wanted everything simple and clean – glass, brass and pretty details. 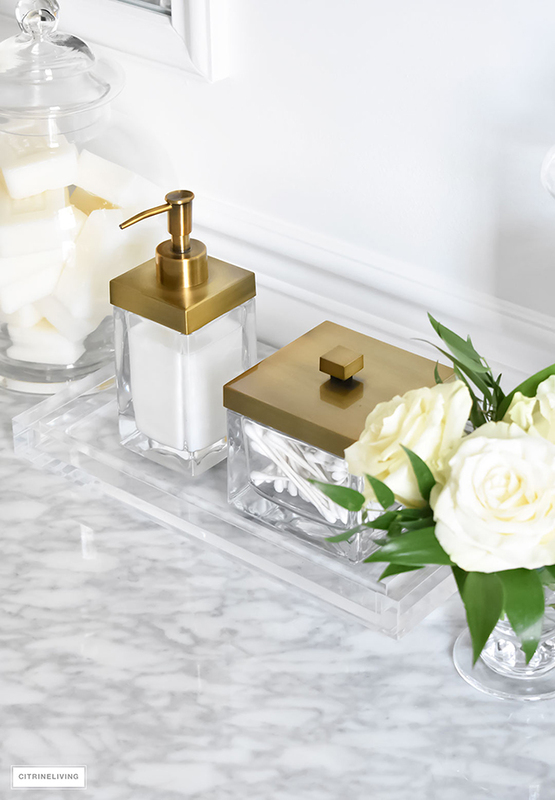 These contemporary brass and glass soap dispenser and container were one of my first purchases for our bathroom and the contemporary acrylic tray grounds them on the countertop. I purposely didn’t want too much covering up the marble and I was pretty excited when I found this piece! 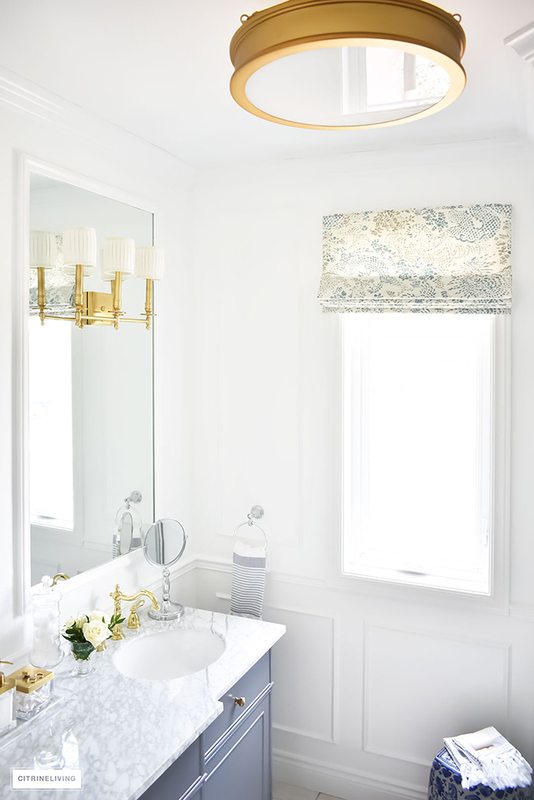 I am absolutely in love with our custom roman blind from Tonic Living. 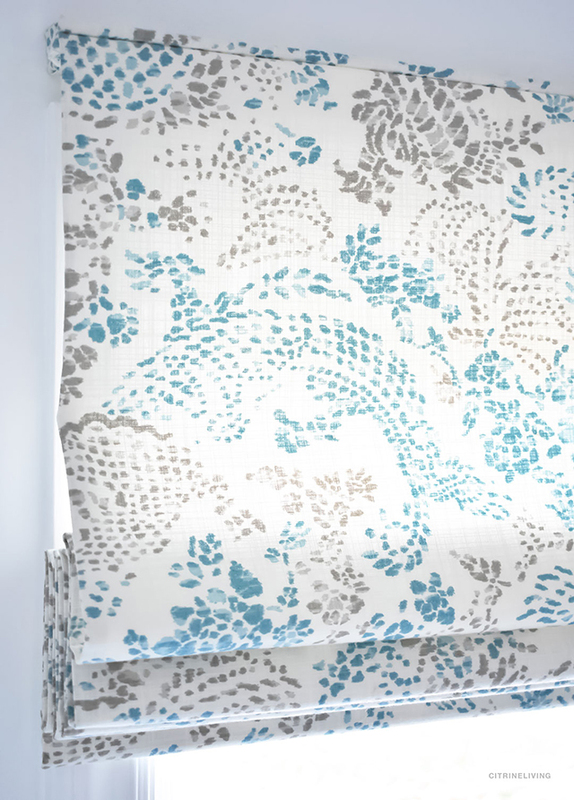 I love the modern take on a chinoiserie dragon motif and the warmer tones in the pattern. The simplicity and clean lines of the shade are exactly what I wanted, and adding a dose of color on the window brings your eye upward into the space. The quality of the custom confection is beautiful and everything I’ve ever received from Tonic Living is of equal beauty and craftsmanship. Working with them is an absolute dream and Janine and her fabulous team always get the job done on time! My gorgeous new blue and white garden stool (I finally have one, yay!) sits beautifully by the window – and I love that this view is the first thing you see as you enter the room. And if you know me well, you know that blue and white makes me very happy! 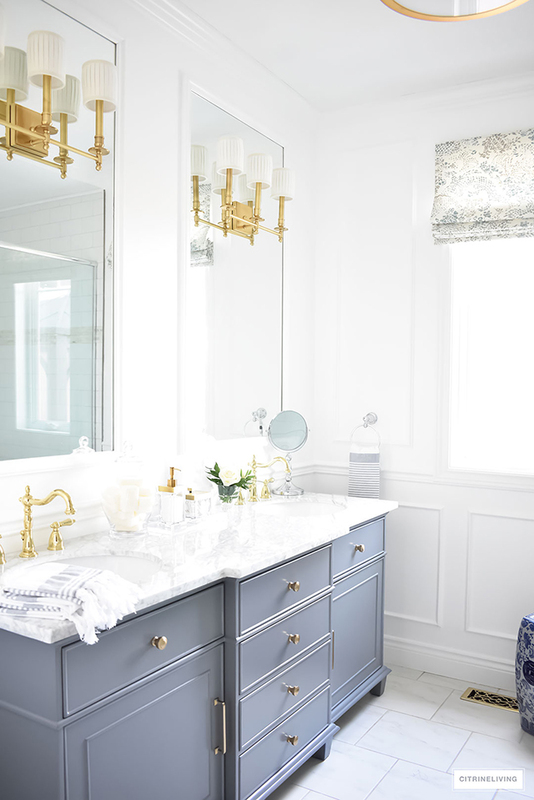 Not to mention they compliment the blue tone of the grey vanity, and all of the brass. I love mixing metals and finishes, and I also love to mix cool and warm tones in a space just as much. That wraps up my reveal! I would show you more and I actually have about another 30 retouched images – no joke – that I could share! I hope this conveys for you what it gives to us every morning and every night. It’s truly amazing how a bathroom can bring you so much joy and feed your soul! I’d love to hear what you think and if you do love it as much as we do! If you’re new to my blog, I’d love for you to hang with me – you can sign up for my newsletter at the bottom of this post! « CHRISTMAS DECORATING INSPIRATION AND WISH LIST! 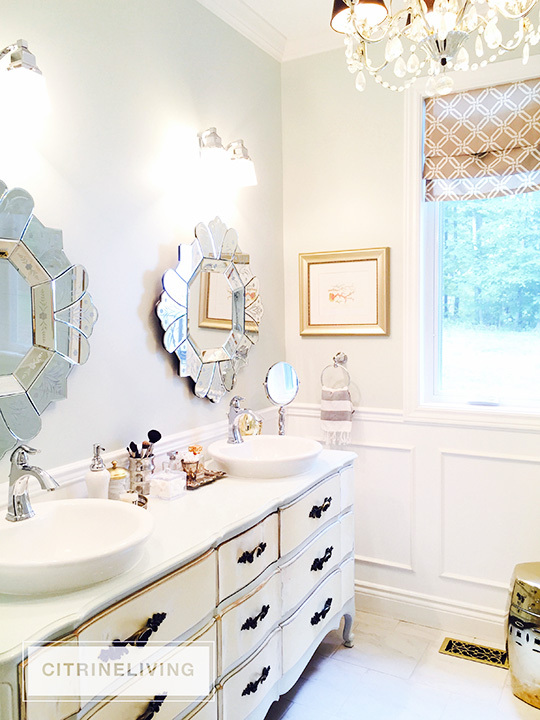 70 Comments on ONE ROOM CHALLENGE MASTER BATHROOM REVEAL! Gorgeous!! What a light, bright, elegant space. Thank you Marci!! We are in love with it and I love that you like it too! It’s absolutely beautiful!! I love everything, especially that vanity! The shape and color of it are just perfect. All of the elements are so classic and tailored, and elegant. Lovely lovely job!! I love it! Those scones mounted on the tall mirrors are gorgeous. Love the grey, blue and gold. Smashing! Thank you so much Joanna!! I am thrilled you like it all! We truly couldn’t be happier! EVERY.SINGLE.DETAIL is superb!!! You nailed it girlfriend!! Gorgeous! Tam! This is fantastic! I love your photography! Everything is so crisp and beautiful! I love the mirrors within the molding and the lighting installed on top! And that vanity is just fabulous! Love the art and love the shades! Great job, my friend! Wow, this is a stunner! Classic and timeless, but fresh. Just one question, why didn’t you do a frameless shower? Nevertheless, I hope you enjoy it for years to come. Happy Thanksgiving! Marguerite, thank you so much, I truly appreciate it! The shower was already installed from many years ago, and there is nothing wrong with it, so we left it as is. In my dream world, it would have been frameless for sure! Thanks for stopping by, Happy Thanksgiving to you too! Your before was great, but the AFTER is just simply marvelous!!!!! Love all the changes especially the new sink console and the molding! Thank you so much Vel! I am thrilled that you like it all! We love it so much! Beautiful bathroom. Well done. Do you mind sharing where you got the mirrors? Are they custom? Thank you Jen! Yes these were custom cut and we added the trim around them! Tam, I loved your bathroom before but I am obsessed with this one. And I don’t think I can pick a favorite detail! 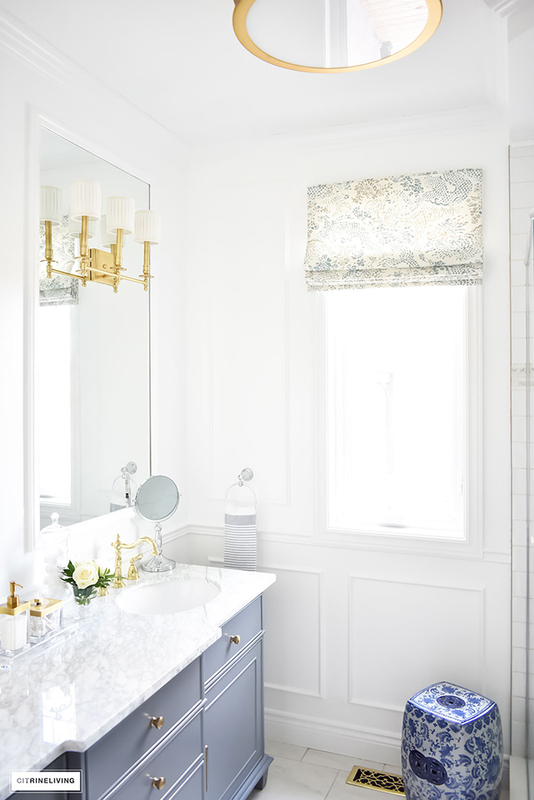 That vanity, the roman shades, that gorgeous art… you’re right- even that toilet is gorgeous (and I’m convinced none of mine are sufficient now after seeing yours haha). Your first ORC and you took this on like you had done 25 before. I hope you enjoy your new spa because you and Neil created a masterpiece! You and your husband truly captured an elegant European hotel look in this remarkable makeover. Congratulations – may you enjoy it for many years to come. Thank you so much Merlyn! WE absolutely love this space so much, it’s even better than we could have imagined! This is stunning!!! Love everything about this space. The brass is making my heart pitter patter. Did you install the lighting on the mirrors?? Was it difficult? Congrats on this beautiful space!!! Tam – this is gorgeous! 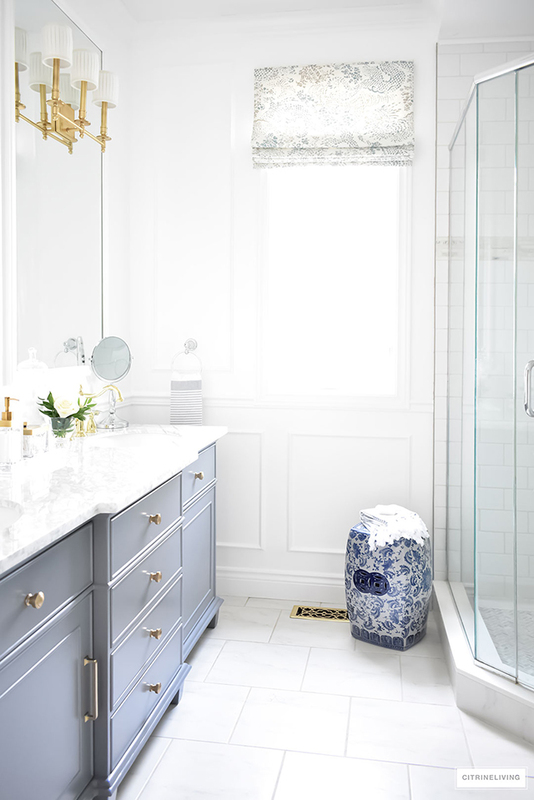 I love the tile, the flooring – the touches of blue! Congrats on a stunning reveal! Your vanity is beautiful. How is it holding up? I am planning on purchasing but read a couple negative reviews… some stating that the materials are not of the best quality. What are your thoughts? I can’t believe I found a blog about this vanity! I would so appreciate your opinion on it. Thanks! I hope you love it as much as we do! Thanks for stopping by!